It has been awhile since my last entry, but I come back with another classic edition of Mastication Monologues. 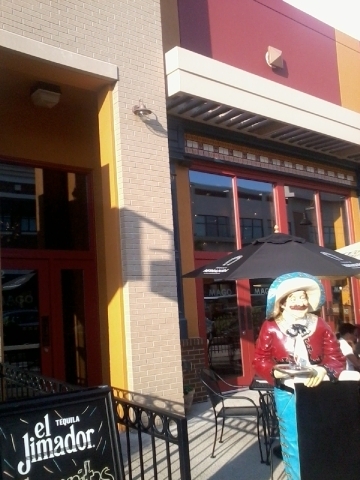 Recently, I went to El Mago Grill located at 641 E. Boughton Rd., Suite 152 I Bolingbrook, IL 60440. It is nestled in the recently erected Promenade shopping center that combines outdoor ambiance with quaint boutique style shopping. El Mago, to begin with, means “The Wizard” in Spanish, and it truly was a magical experience for my family and I. First off, we used this sweet Groupon deal where we managed to get the guacamole appetizer, two Hechizo margaritas, and two entrées for fifteen dollars…a pretty good deal I say, amigo! Anyway, the interior of the restaurant is quite contemporary in design with plenty of bright colors of the American Southwest and Mexico, desert tones/woodwork, and other elements from Mexico like the varieties of tequila that constitute the entire wall behind the bar or the menagerie of luchador (think Nacho Libre) masks that adorn another wall opposite of where you enter the establishment. We started with the complementary tortilla chips and three different types of salsa. The first one was a red chile árbol based sauce that was slightly spicy with a smoky aftertaste that only the dried chile árbol could produce. The second salsa was an interesting twist on a jalapeño based recipe that also incorporated peanuts to provide a mellower flavor that is considered quite spicy for those who can’t handle the heat (I was not phased by any means). 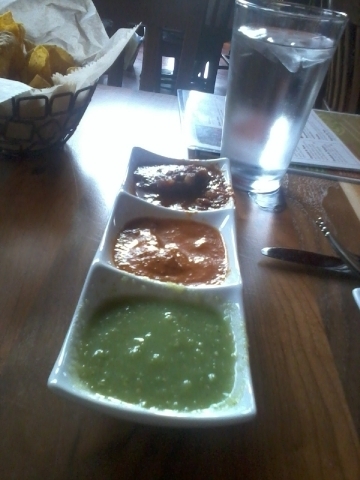 Finally, I decided that out of these three salsas, the salsa verde that was made with cilantro and green tomatillos was my favorite by far. It wasn’t very spicy, but it had a slightly sour wash over your palate that was further enhanced with the texture of the seeds from the tomatillos. 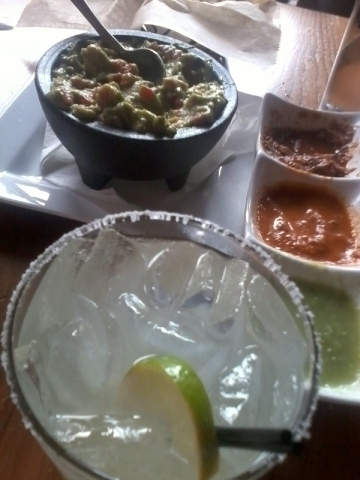 To drink, I ended up imbibing the Hechizo margarita. Even though its name implies a magical spell, I, a mere muggle, was not held under its sway. It was quite watered down and had way too much mixer in it; however, they might have just made it with less panache given the fact we were using a Groupon. So, splash some cash and see if it actually does make a difference. Soon enough, our guacamole appetizer arrived, and the aftermath looked brutal (the bowl was picked clean like a zebra on the Serengeti). Gory comparisons aside, the actual guacamole was quite fresh and creamy. I could taste every single element of this goopy concoction from sweet tomatoes to the very slight hint of the lime juice. It was definitely a nice departure from the typical guacamole in other Mexican restaurants that have the consistency and taste of bland mashed potatoes. Plus, it definitely helped when it came to stomaching the tortilla chips that were abnormally salty ( Dead Sea level), but if that’s your thing, then more power to you. Once that tasty ordeal was over, it was onto the main course. Little did I know I was about to receive the culinary beatdown of a lifetime. 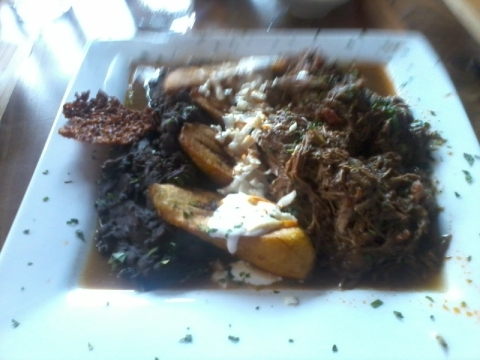 I decided to order the Ropa Vieja (or “old clothes”, strange name, I know) which consists of shredded beef brisket, farmer’s cheese, sweet plantains, and refried black beans. When it came out to me, I didn’t know whether to poke it to see if it was going to bite back or to say a prayer to see if I would make it out alive (it was a monstrous portion of food). The beef brisket alone took up half the plate, but it was so tender you could eat it with a spoon since it was stewed in its own seasoned juices. The sweet plantains really gave the plate a full body and made it even harder for me to finish. However, it was my first time venturing into the realm of the use of plantains in cooking, but I can now say that I am looking forward to trying other Latin plantain dishes in the future, i.e. jibaritos and mofongo. The actual plantains were not soggy by any means, had an underlying sweetness, and seemed to be almost like the potato portion of a steak dinner but with south of the border flavors. As for the black beans, it complimented the plantains to give it a very Cuban feel to the dish, but they were not like the ordinary refried beans they serve at run of the mill Mexican establishments because you could still see the individual beans in the enormous globule that occupied the left third of your plate. In addition to all of this food, they provided me with a “very spicy salsa”, but I was not impressed. So, I managed to finagle with our waitress in Spanish to actually get me a salsa that would make my taste buds and do the lambada (I didn’t quite say this in Spanish…lost in translation haha). Two salsas later, the chef actually whipped up a Habañero based sauce, that finally provided me with a kick that I was looking for, and I provided a show for the Mexican staff as they couldn’t understand how a güero like me could speak Spanish and eat such spicy food? I just chalk it up to being adventurous in terms of traveling, eating, and learning about new cultures…you can go far with an open mind. 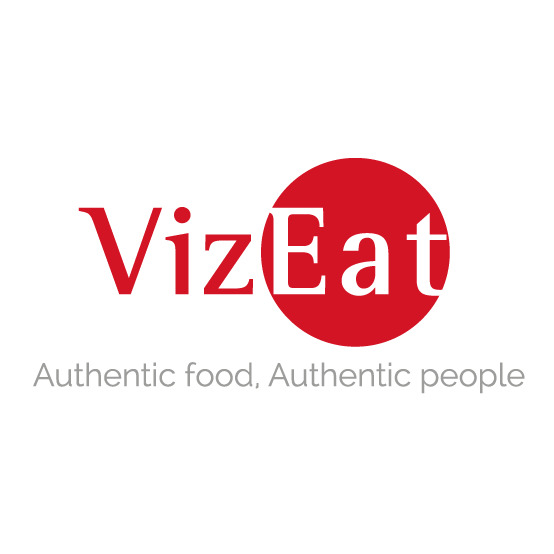 As a whole, this meal was very filling while providing new/unusual flavors and textures and definitely worth the money if you’re looking for something off the beaten path of tacos, enchiladas, and tostadas. In closing, El Mago Grill is a pretty good cantina for those traditional aforementioned Mexican favorites or dishes you perhaps never have heard of like the Ropa Vieja. Plus, the very fact that the chef made up a sauce for me on the spot really made me think that good food is like platform 9 and 3/4s in Harry Potter, “You just have to believe that its there”…now go out and find those good eats! Buena suerte!